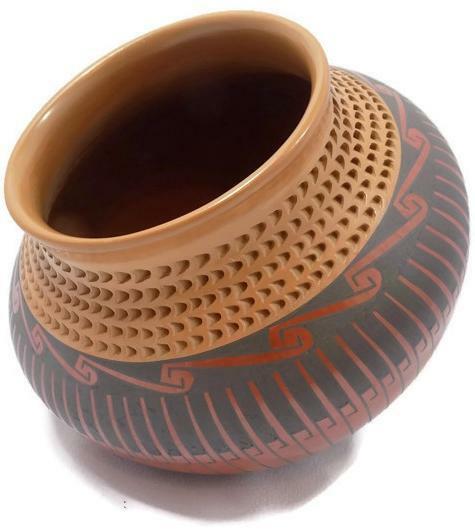 This handsome pottery olla is an early piece by the well-known and award-winning Mata Ortiz, Mexico potter Tavo Silveira. Jesús Octavio Silveira Sandoval was born in 1977 in Mata Ortiz. His father, potter Nicolas Ortiz, and his mother taught him the techniques of pottery making and Tavo became a star of the second generation potters. 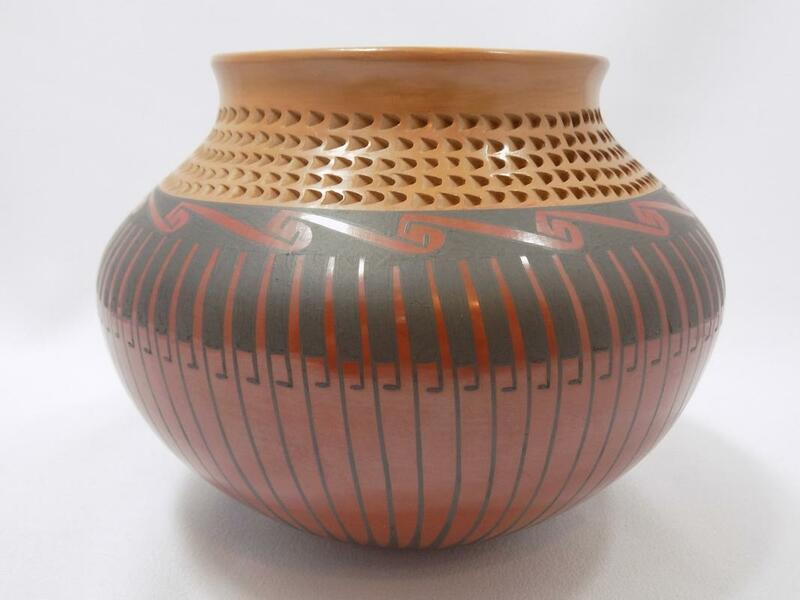 He has won the top Galardon (award) several times at the Concurso de Cerámica Mata Ortiz, the state sponsored pottery competition held annually in Casas Grandes, Chihuahua. 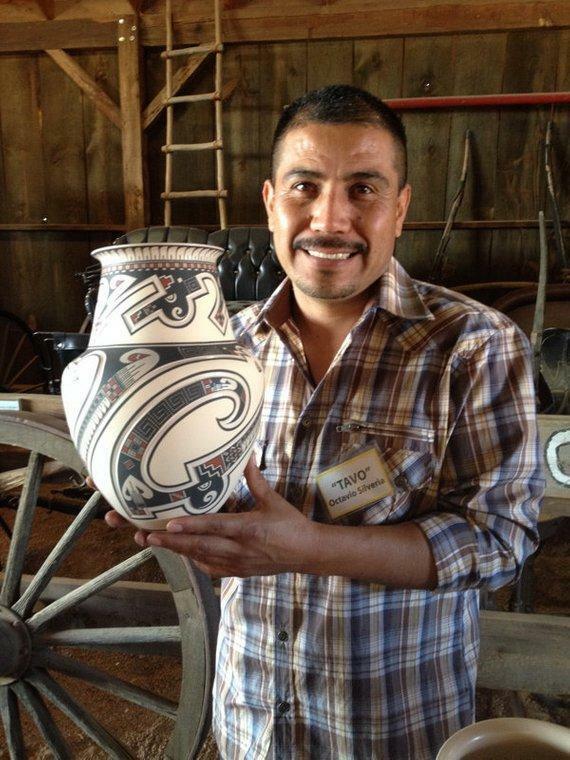 He was commissioned by the state government to create a pottery piece to be presented to Pope Francis during his visit to Chihuahua. His work has been shown in an exhibition at the Mint Museum Randolph in Charlotte, North Carolina, that was entitled "The Shape of Life: Contemporary Native American Ceramics" and it is a permanent part of The Grice Collection of Native American Art there. The last photograph shows Tavo with one of his award winning pots. 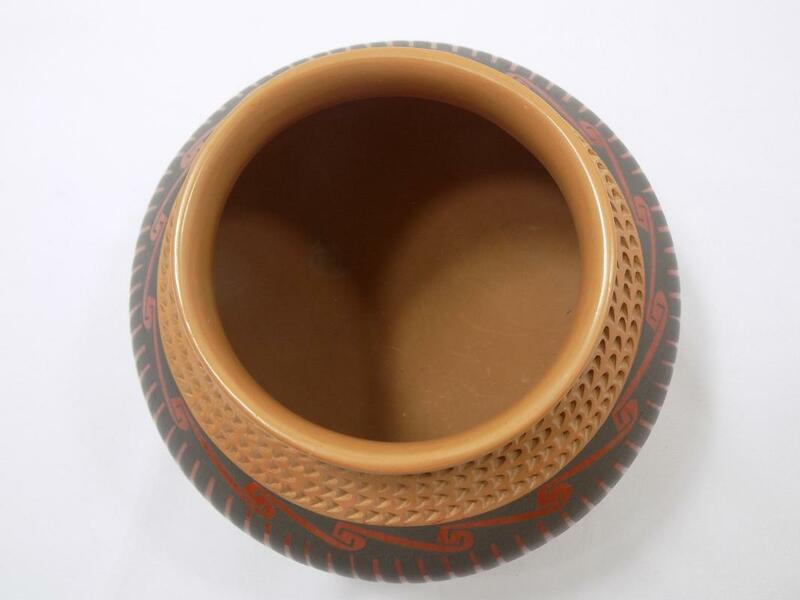 This polychrome pot was hand made by Tavo using local tan micaceous clay; glints of the mica can be seen in the unglazed, scraped smooth interior. 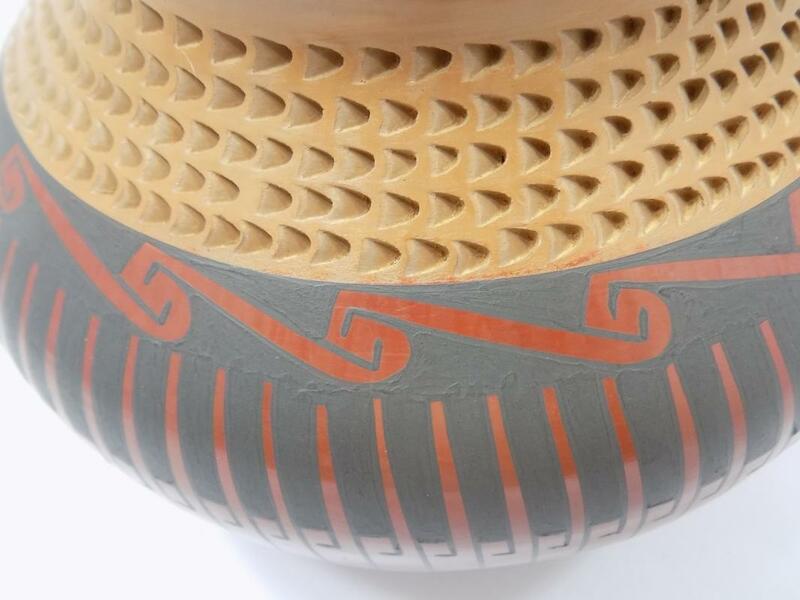 The curved neck of the pot is encircled by five rows of carved crescents, while the remainder of the pot is slipped with pigments in red and black. The burnished designs include a scrolling meander atop a continuous row of standing feathers. Silveira's pieces are sometimes found with the additional signature of his wife, Mirna Hernandez, a talented Mata Ortiz potter whom he married in 2005. 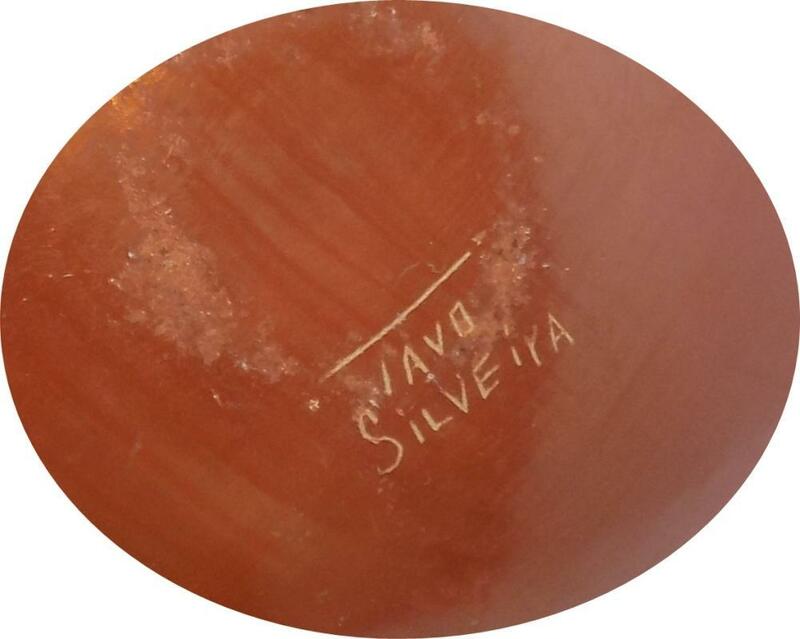 This pot simply has "Tavo Silveira" scratched into the bottom. This olla stands 6 1/2 inches tall, has a shoulder circumference of 24 inches and a mouth that is 4 inches across. It weighs 1 pound 10 ounces and is in very good condition, having some wear to the base (pictured) but no other flaws that we could find. 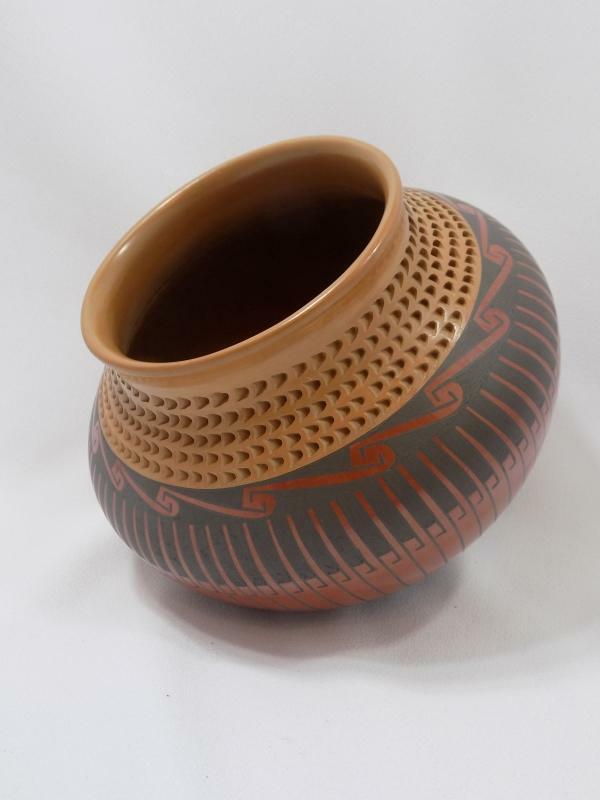 It's a beautiful pot by an eminent and talented Mata Ortiz potter.